People throughout the world have heightened emotions during times of major life changes. These stressful changes may be physiological or social in nature. They are usually connected with personal transitions between important stages that occur during our lives. These transitions are generally emotionally charged–they are life crises. Most cultures consider the important transitions to be birth, the onset of puberty, marriage, life threatening illness or injury, and finally death. Graduation from school, divorce, and retirement at the end of a work life are also major transitions in modern large-scale societies. However, very few of these ceremonies acknowledge the major internal and external transitions experienced by women. A rite of passage, which marks a time when a person reaches a new and significant change in his/her life. These ceremonies are held to observe a person’s entry into a new stage of life and the changes in responsibilities they are may experience. Most rites support the development of understanding of the new role can also facilitating a new learning of how to treat people in new ways after the rites. As women, so many of us did not receive “basic training” about what it means to be a woman. 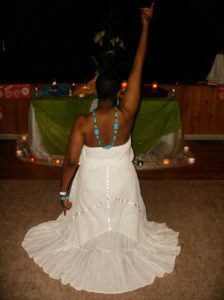 We know what a woman is expected to “do” but few have understanding of how a woman can “be” for herself, within herself. As a result of this missing information and a lack of understanding, many women become overwhelmed, worn out, beat down and lost. 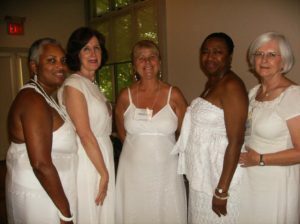 The Rites of Passage workshop will bring women together in their clan, their age group, where they will learn the lesson, blessing and gift of their clan. With this information, each clan will be guided through a gentle and loving process of healing past patterns in order to create a desired way of being in order to move forward with grace and ease. The workshop will culminate with a sacred naming ceremony, offering each participant a new energy to support their new understanding and nature. Daily sessions will begin at 6 am with sacred work; each day will end at 9 pm. Participants are asked to bring a personal journal and, a new outfit of white clothing, preferably, not pants. Each participant is also asked to read and complete the exercises in; One Day My Soul Just Opened Up: 40 Days and 40 Nights Toward Spiritual Strength And Personal Growth this will be the foundation of the workshop.